Offering an alternative to the traditional timber construction curved stairs Signature Stairs have completed a number of stunning 'Turret and Curved' projects. In this example the solid American White Oak steps are spectacularly set in the sweeping lines of the structure and given a modern 'twist' with our 'Helical' balustrade. This elegant winding staircase was again given a modern feel by the combination of our laser cut stairs balustrade with the Signature 'Elegant' stainless steel & glass gallery railings. Utilising this combination of balustrade and guard railing ensured we fulfilled the brief of an elegant curved stairs which flooded the stairwell with light. Viewed from the top down you will see the exquisite sweeping lines in a 'Turret' curved stairs structure. We would advise that curved stairs by nature require some planning and should be drawn as an integral part of your original house plans as they can be difficult to accommodate at a later stage. This is a sample curved staircase from our showroom which highlights the striking American Red Oak finish steps and the additional effect that can be achieved with the correct lighting. 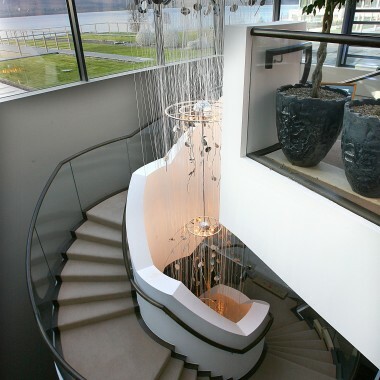 We advise clients that while our balustrades (glass in particular) maximise the use of natural light in a space during the day the winding staircase may also be illuminated to give a completely different but equally spectacular feature when dark. The majority of spiral stairs are modular in design (kit format) which is something Signature Stairs do not offer. We do however fabricate larger custom feature spiral staircases as shown above. This old style spiral stairs design is fused with modern materials with impressive effect. As it is custom fabricated the spiral staircase is solid to walk and finished with solid hardwood steps, built to last generations. Again this project highlights the exciting finish that can be achieved when you merge old style craftsmanship with modern materials producing a curved staircase design that becomes an impressive focal point of your home. Our curved stairs are fabricated to exact radius and the sweeping parallel lines of the stringer and balustrade add a wonderful architectural feature to the design of your home. 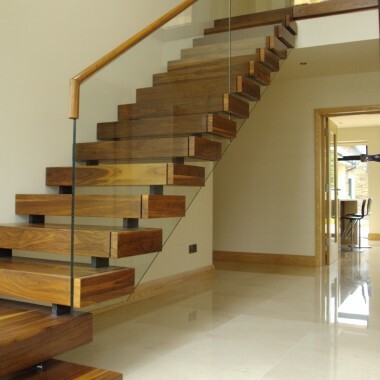 Signature Stairs offer a wide range of balustrades to our curved staircases from curved glass to our stainless steel options. Our Helical balustrade is a fully conforming balustrade with flat plate uprights and solid stainless vertical infill bars. This example is finished with a curved stainless steel handrail, however clients may also choose to use a timber infill in the uprights to match their step threads. Again this is a custom made feature spiral stairs fabricated in mild steel and finished with a mild steel balustrade. The client has cleverly enhanced the spiral staircase by partially enclosing the structure with a curved section of wall adding brilliantly to the overall effect of this stunning spiral stairs. A curved stairs creates a stunning visual impression when you enter a home. All our curved stairs are custom designed to meet your specific project requirements. Our range includes curved stairs, turret stairs & spiral staircase options. The exquisite flowing curves of our turret stairs make it a work of art. Reminiscent of grand castle staircases, the turret is cleverly & sensitively modernised with the use of precision welded stainless steel balustrade and solid timber threads. The gentler sweeping curved stairs are incredibly welcoming and can be used to dramatic effect when combined with a curved wall. We advise early engagement with your architect and potential supplier on curved stairs – each projects comes with its’ own challenges and correct and timely preparation is important to achieving the best possible results. Each impressive structure requires precision fabrication and must be made to a specific radius. The turret stairs is finished with stainless ‘helical’ balustrade which can be softened with timber inlays in the stainless uprights. The undersides of both turret and curved stairs have provision made to take plasterboard finish by the client if so desired. 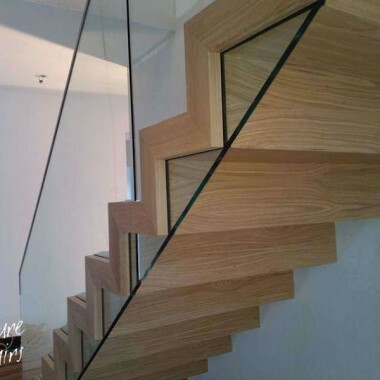 The curved stairs can have open or closed riser steps and be finished with a number of stainless balustrades, or in limited cases curved glass. We can also offer an engineered solid curved handrail option to all curved stairs. Clients are advised that the turret and curved stairs should be planned from the earlier stages of a build in order to accommodate the space and structural requirements. Signature Stairs supply a range of custom fabricated spiral stairs. 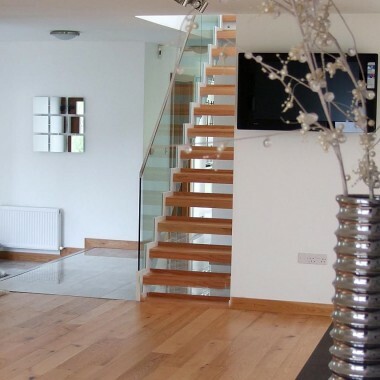 We focus on large custom made, high quality, main access spiral stairs – finished with solid timber steps and mild steel balustrades. Spiral stairs are generally not used as a main access, most are space saving access to a loft area or as a secondary access, for this reason the vast majority are sold in ‘kit’ or ‘modular’ form. We do not offer modular or kit stairs in our range. Watch our video – Custom spiral staircase finished with walnut steps & mild steel balustrade.